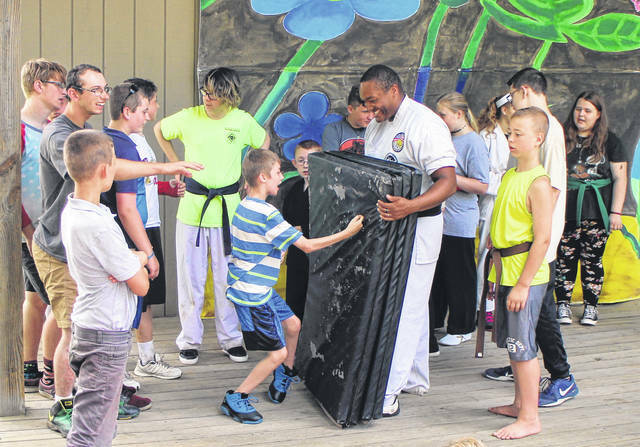 A happy camper takes a jab at a foam mat held by Erwin McIntosh III of 3G Karate at KAMP Dovetail Friday. 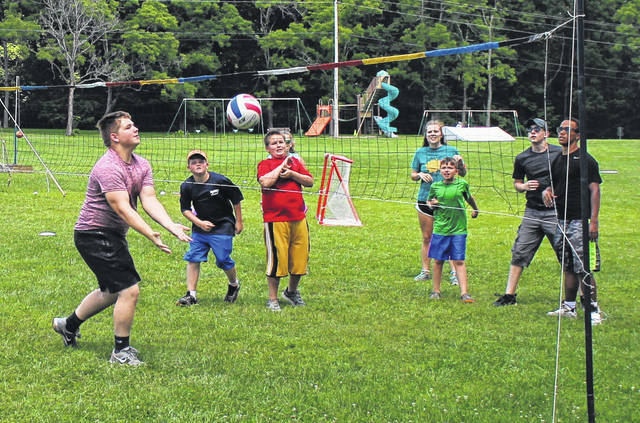 Volunteers and campers play a game of volleyball Friday at KAMP Dovetail. Elizabeth Gray, a camper at KAMP Dovetail, plays as she is held by volunteer Kendra Meiser on Friday. A mid-week heatwave, sudden downpours and an outbreak of tummy troubles didn’t stand a chance against an army of energetic youngsters at KAMP Dovetail this week. 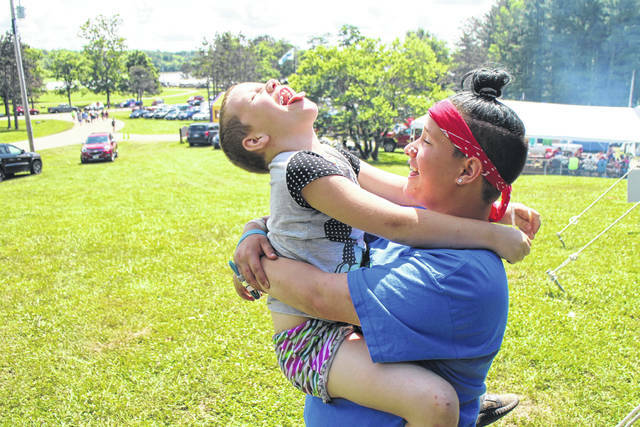 The annual week-long summer camp for disabled children concluded Friday and Saturday with a mass exodus of smiling faces and wheelchairs leaving Rocky Fork Lake State Park. As hundreds of campers wrapped up their activities and volunteers packed up tents, coolers, inflatables and yard toys Friday morning, Linda Allen, director of SATH (Supplemental Assistance to the Handicapped, KAMP Dovetail’s parent organization) joked that she counted this year’s KAMP as a success because they didn’t have to evacuate. Allen said this year’s KAMP was the first time in two years that the whole place hasn’t had to be evacuated due to rain or storms. Rain on Thursday night confined a huge dance party to a new pavilion on the property, but campers were so focused on dancing, they didn’t seem to notice. “It’s kind of an emotional happy-sad thing, because they know they’re going to leave tomorrow,” Allen said. Allen said a stomach bug worked its way through the camp late in the week, affecting 30 or 40 kids, but many begged her not to make them go home. Stomach bugs and overheating are nothing new for Allen, who has overseen activities at KAMP for nearly 30 years. “These are things you know are going to happen,” she said. Allen said volunteers, who are assigned a child to accompany throughout the week, are what make the whole experience work.